Think of something encouraging you often tell yourself. For example: Everything will be ok. Or: Don't listen to them. Or: It'll blow over. Now draw each letter of the sentence on a large piece of colored construction paper or big squares of fabric. One letter per piece. Draw them blocky so you can cut them out. Cut them out. Glue each one onto a piece of construction paper or fabric that is a contrasting color. Then glue the edges of all the pieces of paper or fabric together to make a banner. 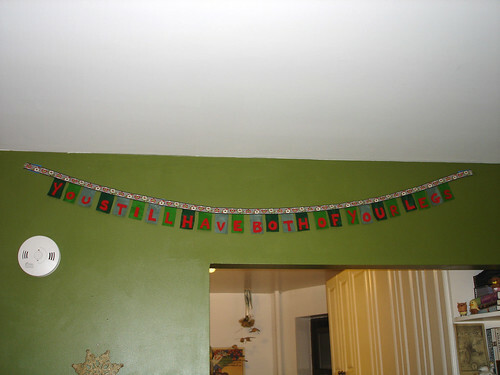 Hang the banner in a place where you or someone else might need some encouragement, for example, across your bathroom. Or between two trees so that you and your neighbors can receive encouragement from it. Or in a gas station. hey, i saw that your banner got posted on learningtoloveyoumore. go you!